John Deere padded ignition key. 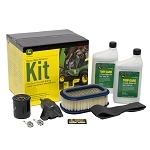 Fits John Deere lawn tractors. 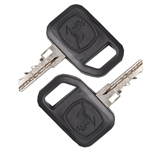 Keys are sold in pairs; order quantity of one and receive two keys. Just what I needed after my only key broke. Ordered and received in a very timely fashion. Exact key I needed for my JD mower after losing the only other key I had. Perfect!! !